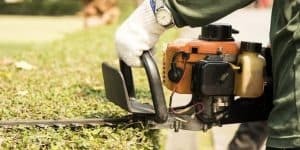 One of the first choices you have to make when purchasing a hedge trimmer is whether you want a gas-powered trimmer or an electric one. In order to make this decision, you’re going to need to know what kinds of jobs it’s going to be used for. If you’re working for a commercial outdoor cleanup company, or have a lot of land to get through, you’re going to want to take a look into gas-powered trimmers. If you’re just looking for something to help keep your lawn looking nice, then an electric or battery powered trimmer will be a great fit. In order to help you make the decision between gas power and electric, this article is going to take a look at some of the pros and cons of both options. Gas-Powered hedge trimmers are going to be where it’s at if you’re looking for a lot of power. Generally, they are capable of cutting through thicker branches than their electric counterparts, sometimes up to 1” thick. They are also often capable of cutting more quickly than other trimmers. This allows you to complete your tasks even more quickly than if you used an electric hedge trimmer. Because they have no cords and require no outlets, gas-powered hedge trimmers are easy to maneuver and use anywhere you need them. They also have less of a problem being used in damp weather. 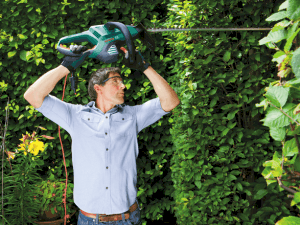 Alongside the positive aspects of gas-powered hedge trimmers, it’s important to note that they are heavier than electric trimmers, which means you may tire out more quickly using them. They usually aren’t emission free, making them less friendly to the environment. These machines require a mixture of gasoline and oil in order to run, which can add to their overall cost. They do tend to be more expensive up front due to the added power and need for a limited fuel supply. Overall, gas-powered hedge trimmers are going to be great for large jobs. If you need to cover a lot of land, gas power is a great choice. It’s also the way to go if you’re working on land that hasn’t been cleaned up in a long time, as the branches may have grown thicker. For the big jobs, it’s absolutely worthwhile to take a look into the gas-powered options available. 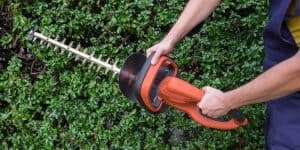 While hedge trimmers powered by electricity or a battery may not be quite as powerful as gas-powered hedge trimmers, they’re still incredibly useful for the kinds of trimming jobs most people need to do. Depending on the model, electric hedge trimmers can cut through branches that are 1/4” to 1/2” thick with ease. These trimmers don’t require any fuel to work; they only need to be plugged in or have a charged battery inserted into them. They produce no emissions, therefore keeping the environment cleaner and healthier while you accomplish your tasks. 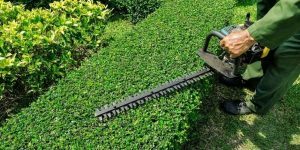 Electric hedge trimmers tend to be less expensive than gas-powered trimmers, and on top of that, you don’t have to worry about purchasing oil or gasoline. They tend to be a lot quieter, so you don’t need hearing protection and can do your work without disturbing your neighbors. These trimmers are a lot more lightweight, making them easier to work with and less likely to cause any strain to your body. 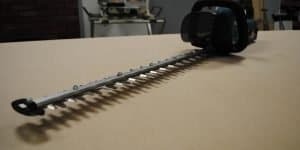 If an electric hedge trimmer is what interests you, you will then have to make the choice between a corded or cordless trimmer, which have some differences of their own. While corded trimmers are the more powerful of the two, the cord can often get in the way. Battery-powered hedge trimmers don’t have that problem, but do come with the risk of running out of battery before your task is completed. In either case, it’s very important to make sure you do your research on the kind of trimmer you want before making a purchase. Overall, the decision between a gas-powered hedge trimmer or an electric trimmer is based on the size of the job that needs to be done. 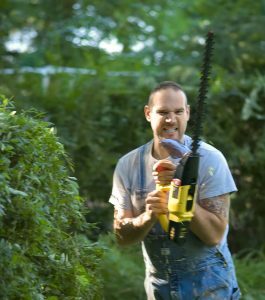 If you are working on a lot of land with larger branches, then you’re going to need the power of a gas-powered hedge trimmer. 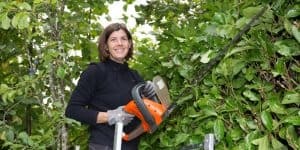 However, if you’re working at home and the job you need to complete is a small or medium-sized task, electric hedge trimmers will give you the perfect balance of cost-efficiency and power. Many commercial outdoor cleanup companies use gas because they have to cover a lot of ground and need the power. They also don’t have the time to make sure they have an outlet or extension cord available, or the time to take breaks to wait for a battery to charge. At home, those abilities are more available and allow you to save money on having to buy gasoline and oil. Electric hedge trimmers are also going to be more lightweight, allowing you to be more comfortable as you get your yard looking magnificent. Regardless of what you choose, a hedge trimmer is sure to make your job easier. They allow you to wield the power and speed that will keep you from having to spend hours trimming the hedges or bushes by hand. That way, you’ll have much more time to focus on doing things you enjoy. 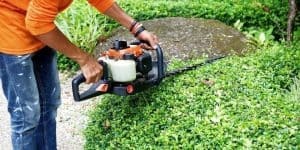 Hedge trimmers are a wonderfully useful tool that take a lot of the stress and discomfort out of cleaning up your yard. 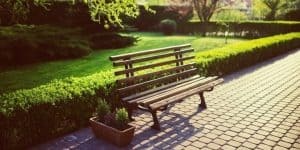 You don’t have to worry about causing a strain to your back, shoulders or arms by trimming each branch manually, and with the electric models available, you can have all this ease and comfort without making the environment pay the price. 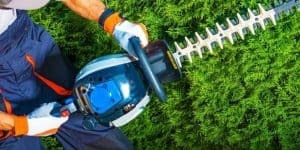 In any case, if you find you’re still having trouble deciding among the hedge trimmer options, it’s always a good idea to talk to a professional wherever you plan to purchase your machine about what your needs are. That way, you’re sure to get exactly what you need for your set of circumstances. What Can Hedge Trimmers Be Used for?